PLOT HOLES! Or, was half the story lost in translation from book to screen? Now, I'll be totally honest here in telling you that I haven't read the book... and perhaps, if I had, I wouldn't feel like the movie is almost entirely one giant plot hole. For example: Missy (Susan Blommaert) the house-keeper. She turns up a couple of times, apparently teaches the little girl inappropriate language, complains her stomach hurts, complains she'll never marry a doctor, and then kills herself. End of story. Why is this annoying? For starters, WHY THE HELL DOESN'T SHE COME BACK AS A "HELPFUL" GHOST? She clearly has a relationship with the family and it's already been established (before she dies) that this universe has ghosts in it–but she just dies and the random stranger ghost keeps coming around to "help" the family although (spoiler alert) he's not really great at it. The only POSSIBLE reason for her character and her death is to further punctuate how idiotic it is for dad (Dale Midkiff) to burry ANYTHING in the Indian burial ground. How you ask? When the friendly neighbor (have I mentioned yet that he's played by everyone's favorite creepy but friendly neighbor Herman Munster–talk about typecasting, ah Fred?) takes dad off to bury the cat, he says his reasoning is that the daughter (who loves the cat, but can't read?! More on that later.) isn't ready to learn about death. Well, had daddy-o just waited a day before turning "dead kitty" into "zombie kitty" Missy would have killed herself and the illiterate kiddo would have learned all about what it means to die. Instead, dad jumped the gun, buried the cat, had to explain death anyway, and then ended up having to kill said zombie cat before losing the entire family. Why the hell can't this kid read?! Blaze Berdahl was 8-9 years old in the movie (roughly, I assume) the age her character is supposed to be. But when the family gets a little guided-tour of the pet cemetery from the friendly neighbor, she bops up to the sign and asks, "what does it say?" Granted–I'm no expert in children, but I know a 7 year old who can read just fine. And okay, I know it moves the story forward, but what the hell?! Why, if you ALREADY KNOW that there's an evil, zombie-making cemetery in your neighbor's back yard, would you show them WHERE IT IS and TELL THEM how it works BUT NOT WARN THEM ABOUT THE ZOMBIE ISSUE?! Just keep your damn mouth shut and there won't be any zombies. This seems like some sort of common sense that we all should have. No zombies = better for everyone, as far as I can tell. NO CONTINUITY! Or, what the hell was the editor doing? From paintings moving from one room to another, to missing clothing and other props, and the apparent teleportation abilities of zombie cats (yeah–who knew THAT was another skill zombies have?! ), I'm pretty comfortable in writing that this movie tops my list of movies with THE MOST continuity errors I've ever seen. TERRIBLE ACTING! Or, why is the cat the best actor in this movie?! And granted, I'm sure it's more like, "the cats" (because they probably had more than one)–but the point remains: everyone in this movie seems like they accidentally wandered directly out of Twin Peaks and onto the set. Maybe it's just bad direction and maybe it's a poorly written script but, everyone waits too long to speak, draws out their responses, laughs at the wrong times, and generally stares blankly into space–right up until they are chewing the scenery in some overly emotional delivery that comes across as comical instead of tragic. Maybe it's a product of it's time (1989) where gross-out and horror comedy were staples, but I honestly felt like I was watching National Lampoon's Zombie Vacation. I honestly think the direction they gave Fred Gwynne was, "just do hillbilly Herman Munster." You might be thinking that I'm just being overly critical here so let me share this with you: there were about 20 or so people at the screening the other night. When the baby gets hit by the truck, dad drops to his knees, looks up to the sky, and does his best primal scream–and all 20 of us in the theatre burst out laughing. 20 strangers laughed at a father's pain over losing a child. And I'm not talking nervous, tension-breaking laughter here–I'm talking genuine gut-laughing over something absurd. ...David Lynch would be proud. 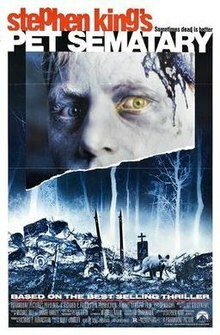 With all of that out of the way, I will say that Pet Sematary has one of the most memorably uncomfortable scenes of any 80's movie: when the zombie baby cuts through the friendly neighbor's Achilles tendon with a scalpel, I literally I want to cry–and even though I know it's coming, it still makes me cringe when it happens. So there you go: Pet Semetery is poorly written, poorly acted, poorly produced, awkward as all hell, and will make you want to wear knee-high boots for the rest of your life.